Local Harley Dealers working with Local Trade Schools in a GLOBAL competition to build the coolest custom Harleys in the WORLD! Our Build team has been working tirelessly since January 1 to build the biggest, baddest, racing bike out there! Now its time to reveal it to you. Join us on April 27th at 1pm for the big reveal! With over 15 years of building experience, our build team took a 2019 Harley-Davidson® Road King® Special and have transformed it into a racer style motorcycle. With the help of 15 students from Cumberland Perry Vo=Tech, "Project Apex" is sure to have everyone talking. 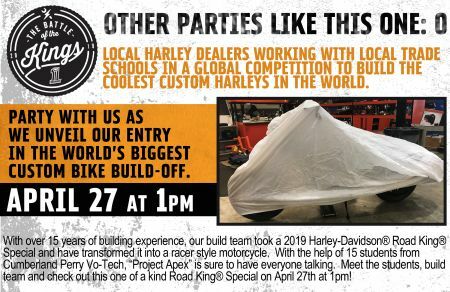 Meet the students, build team, and check out this one of a kind Road King® Special on April 27th at 1pm!